The event will be held from 6.00pm through 9.00pm, and presenters will include Beverly Howell, RN,MSN, Bermuda; Diane Goodman, APRN,BC MSN-C CORN CNRN, USA; Sharon Buckley, RN BSN, Cayman Islands; and Dr. Caren Griffith-Fadlin, MD, Bermuda. “The community at large are welcome to attend; it is a community effort and all are welcome. February is heart month and we have chose to look at the emotional side of the heart. 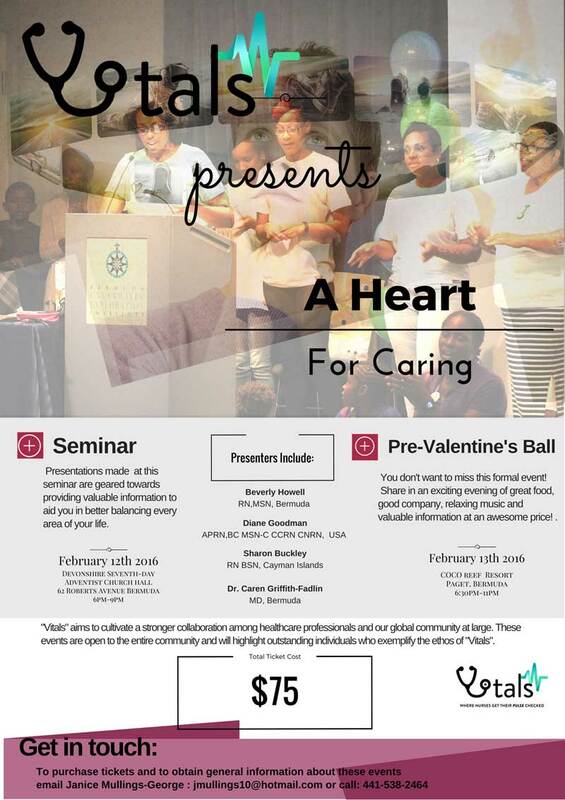 “Topics discussed will include ways to cope with stress and tension; having a healthy, happy heart; rekindling a heart for caring; and a first hand account from the heart of a patient called ‘Hello Cancer,’ by Giovanna Watson, a Bermudian cancer survivor. Tickets, which include admission to both events, cost $75 each. For more information, or to purchase tickets, email Janice Mullings-George at jmullings10@hotmail.com or call 538-2464.